If you live in Oregon, you’ve likely heard of current Ballot Measure 92, which would require products containing genetically modified ingredients (GMOs), to be labeled as containing GMOs‘ if sold in the state. Unfortunately, labeling hasn’t come soon enough, as the Center for Food Safety (CFS) recently discovered that two brands of baby formula sold at a Portland, Oregon area Fred Meyers – Similac Soy Isomil and Enfamil Prosobee Powder Soy Infant Formula – have tested positive for genetically engineered soy that’s been designed to be resistant to Monsanto’s glyphosate and Bayer Crop Science’s glufosinate. CFS, a national environmental advocacy organization, purchased the formula earlier this month and in partnership with Dr. Ray Seidler, the first EPA scientist to study genetically engineered crops, conducted tests on the formula. Aurora Paulsen, part of the CFS Portland office told the Statesman Journal, “I think most moms purchasing infant formula have no idea they are feeding their baby a product that has been genetically engineered to survive exposure to high levels of chemical pesticides.” Considering past research shows that infant and toddler exposure to pesticides and chemicals is questionable at best and at worst, dangerous, this isn’t great news. 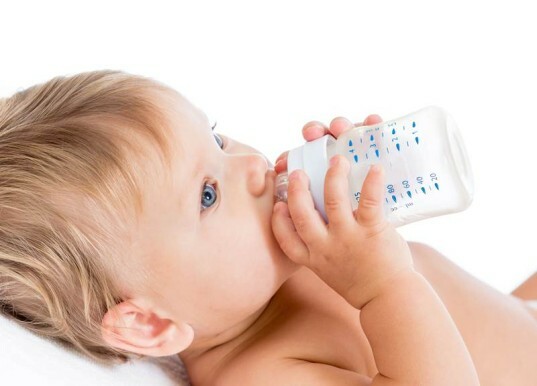 Seidler points out, “Everything we know from the recent medical literature suggests we should be doing everything possible to reduce infant exposure to chemicals. Finding soy in infant formula that has been genetically engineered specifically to survive high levels of chemical pesticide spraying is a real concern and takes us in the wrong direction.” If you’re in Oregon you can help cut back on exposure such as this by voting yes on Ballot Measure 92. If you live in Oregon, you've likely heard of current�Ballot Measure 92, which would require products containing�genetically modified ingredients (GMOs), to be labeled as containing GMOs'�if sold in the state.�Unfortunately, labeling hasn't come soon enough, as the Center for Food Safety (CFS) recently discovered that two brands�of baby formula sold at a�Portland, Oregon area Fred Meyers�� Similac Soy Isomil and Enfamil Prosobee Powder Soy Infant Formula � have tested positive for genetically engineered soy that's been designed to be resistant to Monsanto's glyphosate and Bayer Crop Science's glufosinate.